Welcome To Our "Doll Questions With Answers Two" Page! When we launched this website last July 2003, we offered visitors the opportunity to send in doll related questions for our authority on antique and collectible dolls Pam (Link) to answer to the best of her knowledgeable questions about Antique dolls, Toni Dolls, Arranbee Dolls, etc. Many questions have been sent in from some very nice doll people--most have been answered to the satisfaction of the person asking the question. And we are sharing the questions and the answers with you! This Question is from Sid! I would like to know if a small collection of Madam Alexander miniatures of "Storyboard" dolls are collectible and what worth they have. I have from my late wife several from many countries. If you need more information, let me know. Hi.....all of the Madame Alexander dolls have a value as they are sought by many collectors. I am not sure how old the dolls are that you are referring to. From the '50s until now the small country dolls have been produced. Since you are online........I would suggest you write the names of the countries down.......go to ebay......dolls......then Madame Alexander. Search for the countries or the name of the doll. Just about all listings have pictures so it will be easier to compare to the dolls. To obtain an end purchase price........search the auctions that have closed. This will give you an idea of the value of the dolls. There is indeed some value to them.......but it will be determined by several factors. Madame Alexander collectors are looking for dolls in excellent condition........and if they are the hard plastic and vinyl dolls produced since the '50s.......there is an increase in value if they have the boxes in which they were purchased. If the knees bend.....it increases the value more than those with straight nonbending legs. The dolls marked with ALEX on their back......between shoulder blades........are more desirable than others. My suggestion would be to just list them on ebay. The collectors pay what they are worth. Or advertise the collection in your local newspaper.......after you have grasped an idea of their value from listings on eBay. There are a lot of Madame Alexander collectors..........there are probably a few in your area. If you are in a metropolitan area.......there will be many. Hope I have been of some assistance. It would be almost impossible to give you an idea of their value without having them at hand to inspect. Good luck........I am sure you will find many anxious collectors out there. This Question is from Cathy! It is 4-1/2" tall and made of celluloid(?). -It came from the Canadian National Exhibition as a prize. -Made in Italy -Has eyes that move, but the eyes have disengaged and are inside the head -Dressed in the original dress which was glued to the body and the skirt part is tied on with string. -Painted blue shoes and white socks. The doll is in very excellent condition, except for the eyes being inside the head. -It has been stored, probably forever. Can you give me any information as to the value of this doll? Thank you. Also, I have a doll that was given to me by my Aunt when it was new, in the early 1960s. -Made by Reliable -Purchased with IGA Bonus Stamps -Approximately 15" tall -Blonde synthetic waist-length hair -Original dress, white with red design, fitted top with pleated skirt. Can you give me any info on this one? Excellent condition, missing shoes, and socks. Hi Cathy! You provide some excellent descriptive information. The sleep eyes in the 4 1/2" doll lead me to believe she is probably later than 1917. A "travel" or "souvenir" doll, she does have a very well documented history. Without seeing the doll......even though your description is thorough I cannot be sure of her age. In reading it over again......I still keep going to the, and 50's hard plastic which resembles celluloid. Again, there was another celluloid type same era.......mostly French dolls. The Reliable doll is probably the more valuable of the two. Ignored by collectors for years.......Reliable made some lovely and collectible dolls. They are just now receiving the credit due them. I do know there is a book.. Canadian Dolls......3rd edition.....The Charlton Standard. I have not had the opportunity to read it............so do not know if the doll in question is even covered in the publication. For a reasonably accurate estimate of value........I do recommend that you go online to the eBay auctions. For the "celluloid," go to the "Antique Dolls/Other" listings. There are pictures at the left of auctions which will help you to recognize your doll. The end price is very near the accurate going rate for that particular doll. Type "Reliable Doll" into search in the doll section of ebay. That will pull all information from all categories pertaining to that doll. And then there is your local library ........the doll book section........find a price guide. I regret that I am unable to give you a definite value, but it is almost impossible to estimate without actually seeing the dolls. Good luck. This Question is from Elizabeth! Hi....yes your dolls do have value. The AM 1894 is a German doll made by Armand Marseille. That mold # is one of the loveliest he made. AM dolls are considered the most common.......but there is value there. The 119 and 109 are #'s used by Handwerk.....there is an article on this site in reference to them. But, the Paline......I do not know what that is. Bru is the most sought after in the world of doll collecting. Within the next few weeks, we will be adding an "article" to the site about the Bru. They are very rare.......and if your doll is an authentic early Bru, she is the most valuable of the three. The last two dolls that you are inquiring about are the most popular......to be reproduced by many new doll artists. You would need to be certain that they are authentic old dolls before you attempt to sell them. Unfortunately, I am unable to see them or handle them........so can not help you determine the authenticity. Perhaps a visit to a local doll show or antique dealer would help to determine the age. If the Bru is ascertained as authentic and old...........please do not sell it outright. Get back to me and I will give you direction as to where you can obtain the highest dollar for her. This Question is from Kathleen! I have a doll that I would like to get some information about. It's a Horsman Doll Manufactured in Trenton NJ. The dolls have a yellow dress with silver lace on the outside. She has white shoes and hose. I've never seen hose on a doll before. The doll has blue eyes, lipstick, and earrings. She is 18" tall. Can you help? Hi Kathleen. The fact that she is wearing nylons......tells me she probably has feet which wear high heel shoes. The lipstick and earrings are another great clue. She sounds like a fashion doll from the late 1950s. Young adult girls were wearing the fashions of that era. Horsman made some lovely fashion dolls during this time frame. One is called "Cindy." They also produced ballerina with the same features you described ......but toes would be pointed to accommodate ballet slippers. Hope I have been of some assistance. This Question is from Tom! I found these dolls at an estate sale and was wondering what they are and what the approximate value is The first one is hard material with the soft stuffed body. The eyes open and close and the mouth is open and you can see the tongue. The second one is rubber with the cloth body and the eyes open and close. Hi....the first doll is a composition and cloth from the 1930s. It is difficult to tell her exact condition. But, it appears that there is no cracking or peeling of the composition. You did not mention if there was any manufacturers name on the back of her head or shoulder plate to identify her. 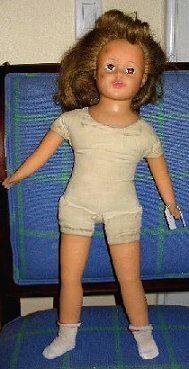 Recent auction sales of this type doll put her in the 75.00 up range. That is if her composition is as good as it appears. Perhaps more.....if there is an identifying mark. The second doll is from the '50s.......and her limbs are an early vinyl which does "tan" or darken. Depending on who the manufacturer was......her value will fluctuate. She is the lower valued of the two. Anywhere from 25.00 .......perhaps upward depending on the marks. The estimates are based only on the auctions that I have observed ending on ebay. Since eBay now controls the value of dolls more so than a local doll show........it is probably lower than you would observe in shops and shows. Good luck with the dolls..